A UIMA graduate assistant curates a fascinating exhibit on the history of print reproduction. Art lovers don't have to visit the Vatican or the Sistine Chapel to enjoy priceless works. And artists don't have to travel the world to spread their talents far and wide. Thanks to the process of printmaking, art flourishes in local art museums, in schools, and in coffee houses— everywhere. A UI Museum of Art (UIMA) exhibit, presented through May at the Figge Art Museum in Davenport, explores the last 500 years in Western printmaking history. Curated by graduate assistant Nathan Popp, 07BA, "In the Footsteps of Masters: The Evolution of the Reproductive Print" traces a visual timeline into the beginnings of Western reproductive printmaking and its transformations throughout time. The exhibit features some 80 pieces from the 15th through 20th centuries—original prints and drawings, as well as reproduced works. In the period before photography, prints of notable originals were produced through techniques such as engraving, woodcut, and etching. These prints allowed artists to disseminate their work widely and reach broader audiences. As the process matured, printmakers would often add their own creative flair to prints instead of developing strict copies of originals, adding to the interpretative experience of art and creating new print techniques. "Reproductive prints made a big impact on artists' educations and made the dissemination of ideas much more efficient," says Popp, whose inspiration for this exhibit came from the UIMA's impressive collection of works on paper. "By producing multiple copies of a print after an original work, images could travel all over Europe. This is how ideas were exchanged to become the driving force of artistic progress." Some of the works showcased in the exhibit include originals from Edouard Manet, Jean- Baptiste Corot, William Blake, Francisco Goya, and Grant Wood. Visitors will also have the opportunity to view reproductive prints made after famous masters such as Raphael, Peter Paul Rubens, Rembrandt, and Michelangelo. Popp notes that many of the prints are after paintings that have been destroyed over time, an excellent way to study works that are no longer accessible. He's also paired many prints and drawings from the same artists to provide insight into the creative process. "What gets me most excited about this show is the actual pairing of prints with paintings or drawings," he says, noting that the highlight for him is a lamentation by Annibale Carracci. "After making the fresco, Carracci made a print after his own work and this in turn was copied by others. 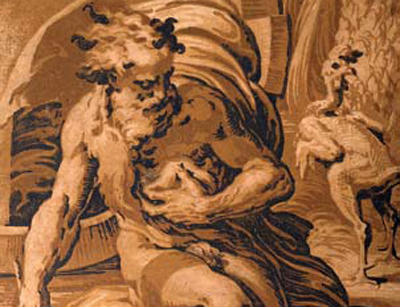 I was fortunate enough to locate both Carracci's print and one of the drawings after it. Putting these together shows evidence of three generations of the same image… and illustrates an intellectual conversation amongst artists."